This is very interesting Odd One Out Word Crossword Puzzle. In this Picture Riddle, there are four images of word crossword puzzle. 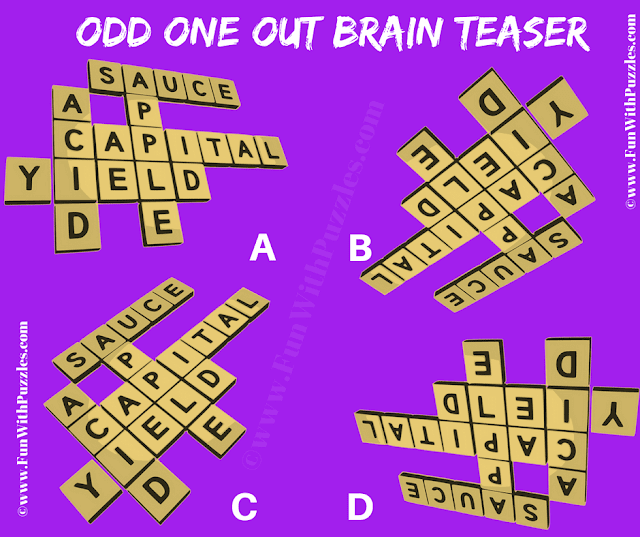 Three of these puzzle images are exactly alike. However there is one puzzle image which is different from other 3 images. Can you find out which crossword puzzle image is different? Can you solve this Odd One Out Crossword Puzzle? 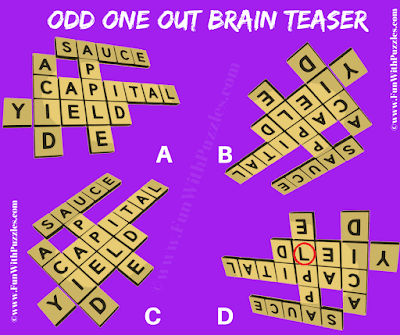 Answer of this "Odd One Out Word Crossword Puzzle", can be viewed by clicking on button. Please do give your best try before looking at the answer. 1. How to solve Crossword Puzzles? : If you are new to solving crossword puzzles, do checkout tutorial on solving the crossword puzzles. 2. Rebus Riddles with Answers: If you love solving word puzzles, then you will definitely like Rebus Puzzles in which your challenge is to find the hidden meaning of the given picture puzzle image. 3. Fun Word Brain Teasers with Answers to Challenge your Mind: Here are the word brain teasers to test your knowledge of English. 4. Fun Brain Teasers For Kids, Teens and Adults with Answers: It contains not only the word brain teasers but also Mathematical and Logical Reasoning puzzles to challenge your brain.